You’ve decided to join a boxing gym. The direct debit is set up and all that’s left is to walk in and start training. Boxing gyms can be intimidating places but with a little preparation and advice, you can get through your first day, the first week and make it an entire year to become a permanent boxing gym resident. 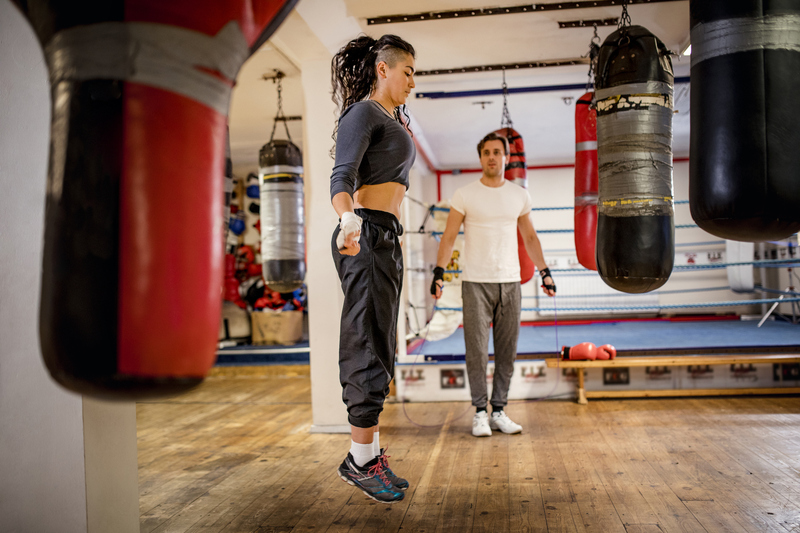 From what to eat before your first class to what you will to feel like when you leave your first session, read on to know the things to expect when joining a boxing gym. What to wear at a boxing gym? You are going to sweat – by the bucket load – so make sure your fabric is breathable, cool and absorbent. Also, make sure your clothing is form-fitting as baggy clothing can fall down and get in the way of exercises such as burpees, squats and rope jumping. Also, there is every potential baggy clothing could be grabbed, ripped and used against you. So best avoid completely. For longer hair, a workout headband will work wonders at keeping the hair out your eyes and drenched in sweat. On your first day at a boxing gym, you will be considered a newbie and when you first walk in, don’t expect anyone to greet you. Especially don’t expect a trainer to come up to you and give you their undivided attention. Of course, this does depend on where you go however don’t feel hard done by if you are completely blanked as it is seen as a test. A trainer’s time is highly valuable and there is a sense of proving you are serious about boxing before you get a slice of that time. The trainers will know the times allocated to pro, amateur and lifestyle boxing and will let you know when asked. Remember, the trainers are the gatekeepers to the clubs and usually welcoming. So keep going and going because eventually, this shows that you mean business and you will earn the coach’s attention. You may find there are times allocated for professionals, amateurs or those who like to train for the lifestyle. You. Will. Fall. Behind. Expect to be slower and not perform the exercises as well as the more seasoned boxers in your session. But you shouldn’t be disheartened. Every person in the gym has had their tough first day and its the boxers who keep at it that gain the respect, fitness and skill who reap the rewards. Following is a list of things to pay attention to. Boxing isn’t for the faint-hearted especially when you go to a boxing gym with all the serious boxers training. But if you stick at it, work hard and prepare yourself, then you will be sparring in the ring with the big boxers in no time. It’s also important to remember that a boxing gym is a tightknit community and is a part of the local community it serves. Like in life the only stupid question is the one you don’t ask. Although boxing gyms can be intimidating initially, you will soon realise that everyone is training to be the best they can be and interested in their own levels. As you start to be a regular you will make friends. You will feel welcome and respected. Being a part of a club is like following a football team there will be opportunities to support shows and if you stay and learn maybe you will get the opportunity to show your skills and knowledge on a show if that is your goal. You will never be pressured to box or spar. People that do box and spar do so as a part of their goals decided between you and your trainer. Boxing training is a lifestyle and a very open community you will find male and females from every age from 8 to 80 and from every community.